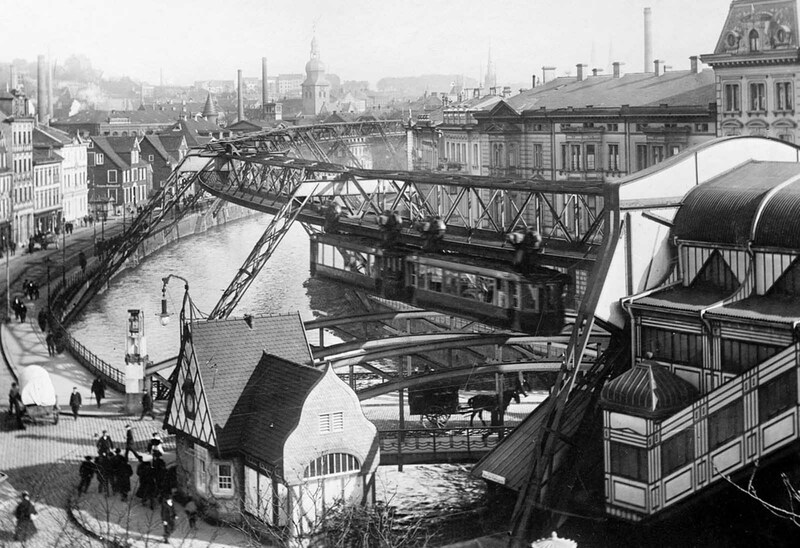 The Wuppertal Suspension Railway, perched above the river Wupper in the German town of Wuppertal, photographed on January 8, 1913. In January 8, 1913 — a photographer in Wuppertal, Barmen (Germany), captured this image of the unique suspension railway that runs through the town, with cars hanging above the Wupper River. The 13 km rail system known as the Wuppertaler Schwebebahn had just been completed 12 years before, and became well-used by locals—by 1925 the company claimed it had transported almost 20 million passengers. The story of The Wuppertaler Schwebebahn starts in 1887 when the cities of Elberfeld and Barmen formed a commission for the construction of an elevated railway or Hochbahn. In 1894 they chose the system of the engineer Eugen Langen of Cologne, and in 1896 the order was licensed by the City of Düsseldorf. Construction on the actual Wuppertal Suspension Railway began in 1898, overseen by the government’s master builder, Wilhelm Feldmann. On 24 October 1900, Emperor Wilhelm II participated in a monorail trial run. In 1901 the railway came into operation. Around 19,200 tonnes (18,900 long tons; 21,200 short tons) of steel were used to produce the supporting frame and the railway stations. The construction cost 16 million gold marks. The railway was closed owing to severe damage during World War II, but reopened as early as 1946. The Schwebebahn is also famous for an incident in 1950, when a young circus elephant named Tuffi was given a ride as a stunt. Tuffi apparently was not a fan of the railway, causing a ruckus on board that led to her falling out a window, dropping 12 meters to the river below. Tuffi survived with just a scrape, living to the age of 43.